Iliacus is a fan-shaped muscle which creates the lateral portion of the iliopsoas muscle. The upper two thirds of the floor of iliac fossa. Inner rim of iliac crest. Upper surface of the lateral part of the sacrum. The fibres join on and merge together with the lower part of the psoas major laterally as well as inserted with it on the anterior surface of lesser trochanter along with 2.5 cm long area under it. Inferiorly, an iliacus muscle occupies the iliac fossa on each part. 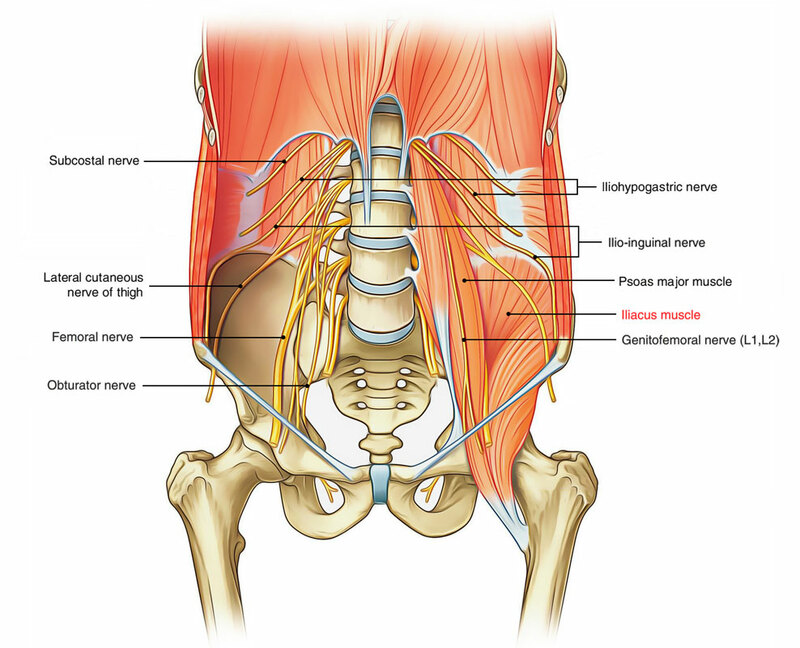 From this extensive origin the muscle travels inferiorly enveloping the iliac fossa andconnects with the psoas major muscle and attaches towards the lesser trochanter of the femur. The iliacus combines with the psoas major in order to enter the anterior chamber of the thigh and insert via a common tendon on the lesser trochanter of the femur. The iliacus and psoas are thus collectively referred to as the iliopsoas muscle – they act in a synchronized manner in order to flex the thigh on the hip joint, as well as acting to create lateral rotation of the thigh. The iliopsoas muscles are the strongest hip flexors. It is innervated by divisions of the femoral nerve. The iliacus flexes the thigh at the hip joint whenever the trunk is stabilized similar to the psoas major muscle, as well as flexes the trunk contrary to gravity whenever the body is supine. As part of the iliopsoas, the iliacus is vital for lifting (flexing) the femur forwards. The iliopsoas turns the trunk forward as well as can raise the trunk from a lying posture for the reason that, the psoas major traverses several vertebral joints along with the sacroiliac joint. The iliacus acts specifically on the hip joint from its point of inception in the lesser pelvis.